Things are really starting to get busy for me leaving me no time to blog. But there are SO many things I want to post about and do with my blog!! >.< And although I may not be commenting much lately I am keeping up with all your wonderful blogs! I just wish there was more time in a day! 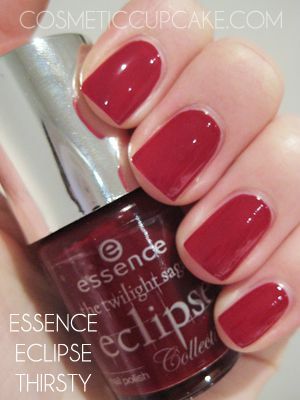 Here's my quick NOTD featuring Essence Eclipse polish in Thirsty. Thirsty is a gorgeous dark red jelly that really looks like blood and if I was a vampire I would definitely be thirsty! It applied very smoothly and drying time was great. 2 coats was needed for opacity and it dried to a high gloss finish. It was a pain trying to capture the colour of the polish as it changes in different lighting and my camera kept picking it up as bright red even though it was night when I swatched it. Go figure! My hands look a strange colour because I had to use the neutral colour setting on my camera to get the color of the polish closest to what it looks like in real life. I then konaded some lips using Bundle Monster plate BM 02 using Konad Special polish in white. the color looks so luscious! nice match with the kiss stamp :D! I Love it! <3 i hope to find it in the italian stores! @Monika: Thanks Monika =) It definitely is a luscious colour! @Mae: You are too kind Mae! Thank you so much for the sweet compliment. @Kasy: Glad you like the colour! Thanks for stopping by my blog and commenting! @Alice: I hope you can find it too! The Eclipse collection of polishes are lovely. very nice! i like they kissy face stamps to. it really complements the mani.